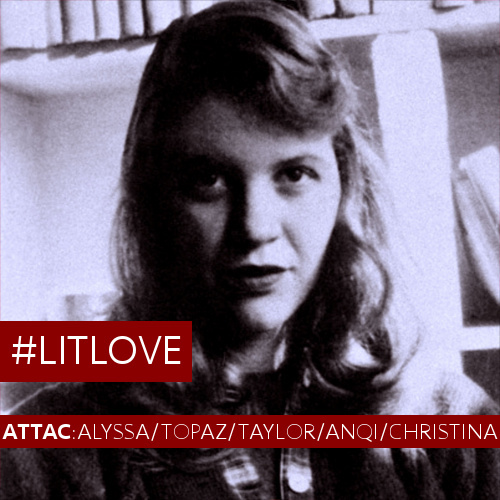 The #LitLove series is a bimonthly collaborative blog event with Topaz, AnQi, Christina, and myself, wherein we each express our literary love for different books under the same overarching theme/topic/author. For a more detailed backstory, take a look at the first #LitLove post. This month, we're delving into the lovely writings of Sylvia Plath. So who is Sylvia Plath and why does Alyssa love her? In Wikipedia's words: Sylvia Plath was an American poet, novelist, and short-story writer. ... Plath is credited with advancing the genre of confessional poetry and is best known for her two published collections, The Colossus and Other Poems and Ariel. In 1982, she won a posthumous Pulitzer Prize for The Collected Poems. In my words: Basically my writing inspiration, except she does a lot more poetry than prose. Sylvia Plath simply writes the most gorgeous words. There is no debating this. I have a Tumblr tag devoted to her, and really, her words are far too exquisite. A good Plath reading session for me alway ends with screams and keyboard smashes and marriage proposals. Today, we are talking about Ariel, one of Plath's many poems. I chose to spotlight this instead of other works, such as her only novel The Bell Jar, or my personal fav, Widow, because of how dreadfully difficult analysing this was. First month of school, and already such an IB student. *sighs* Go me. My first thought: ooh it's like the fairytale. There was quite the vibe like a dark fairytale retelling. And when you consider the story, where Ariel longed to be in the human world, the crushed and trapped vibe the poem gives off isn't surprising at all. It even fits with Plath's own history of depression, given how gloomy it is. Apparently, I was off the mark. According to Shmoop: the name is a reference to The Tempest. In Shakespeare's The Tempest, there's a spirit called Ariel. Unlike Caliban, Ariel is a kind-hearted, compassionate being, and serves Prospero gladly, although he does have his eyes on liberty. Before Prospero and Miranda arrived on the island, Ariel was imprisoned and freed by Prospero. Still, there was that trapped feeling, right? I wasn't that far wrong. Ariel is actually about Plath's experience falling off a horse. And those previous interpretations of losing control, well, I guess we could take it more literally as losing control of the horse. But at the same time? If we're talking context, Plath's history of depression might let us factor this poem into more than one unfortunate event. In the end, I don't think it really matters which interpretation you subscribe to. Bask in the words, drink them in, and smuggle them into your heart. Perhaps that is all we need. What are your thoughts on "wrong" literary interpretations? And don't forget to check out everyone else's posts!